This section provides more detailed information about the importance of riparian buffers, instructions about streamside planting, a list of Catskill native trees and shrubs and where to get them and other guidance about proper management of the streamside area. 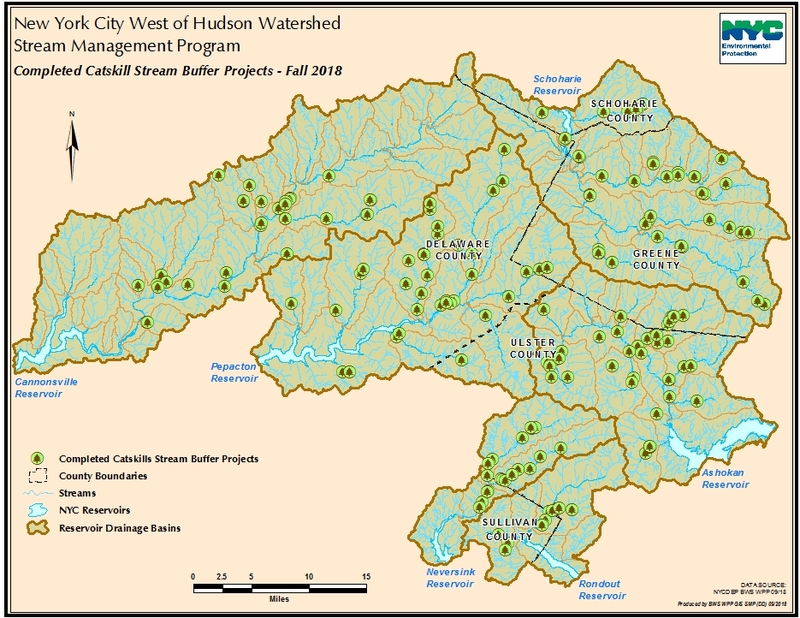 Click here for the Catskill Streams Buffer Initiative Page – This program assists landownwers with technical and financial assistance for their riparian buffers. Click here for a map of riparian buffer restoration projects as of October 31, 2018. Click on topics within the boxes below for a list of native plants for various planting purposes. In addition to allowing the growth of diverse streamside buffers, properly dispose of yard and household waste. Unfortunately, some people think of streams as garbage dumps. Debris can become a hazard during floods, and it can pose a threat to our groundwater. Remove old tires, garbage, and litter from your property and store these materials as far from the stream as possible. Waste from pets and livestock is a significant source excess nutrients and bacteria. Dispose of your pet’s waste in the trash and store and livestock manure properly. Finally, hazardous substance such as paints, thinners, solvents, grease, oil, carpet cleaning water, pool and spa water and detergents should not be dumped into streams, septics or stormwater collection systems. Your town or county may sponsor a day (i.e. Clean Sweep in Delaware County) to collect household hazard waste. Using alternatives, or reusing and recycling hazardous fluids and other products, can reduce the amount of waste produced in the first place. Catskill Streams Buffer Initiaive – The goal of the CSBI is to inform and assist landowners in better stewardship of their riparian (streamside) area through protection, enhancement, management, or restoration.